Newport, Rhode Island is a classic New England summer resort town of the rich and famous. Some of the wealthiest families in America owned summer “cottages” in Newport in the early 1900s. It was once known as the city of “Summer White Houses” during the administrations of Presidents Dwight D Eisenhower and John F. Kennedy. In 1953, John F. Kennedy married Jacqueline Bouiver in St. Mary’s Church in downtown Newport. Each year thousands of tourists flock to Newport to experience the charm of this classic seaside town. Many choose to indulge in their favorite seafood dishes, take a stroll down the 3.5 mile public Cliff Walk trail, or experience how the “other half” lived while touring the various Guilded Age mansions of the Vanderbilts and the Astors. I enjoyed all those activities during my weekend in Newport with my best friend, but the one activity that I was truly looking forward to was the polo match on Saturday afternoon. Growing up I rode horses competitively for 10 years and when anyone mentions the word “horse” or I see a horse, I immediately get giddy with excitement. I’ve never seen a polo match before as it is not played in such places as Maine. Polo very much is known as the sport of the rich and famous or royalty (at least in the US). The Newport Polo Club was founded in 1876 in Newport, Rhode Island. The club is a functioning body of America’s first polo club, the Westchester Polo Club. Many of Newport Polo Club’s founding members were from Westchester County, NY and summered in Newport. The original club remained active until 1929 where it stopped due to the onset of WWI and The Great Depression. The club was revived again with its original name in 1992. Today it is a registered club with the United States Polo Association. The Newport Polo Club has a wonderful in-depth piece of the club’s history here. Polo is a team sport played on horseback. Players attempt to score against the opposing team by driving a small white ball through a goal post with a long-handled mallet. Each team consists of four pairs of horses and riders on the field at one time. The game is played on a large field at speed. Games last about 2 hours with periods called chukkas of 7 minutes. Most games consist of between 4 and 8 chukkas in a match. Newport Polo plays 6 chukkas in their matches. The very first polo game ever played occurred in Persia (now Iran) around 6th Century BC and 1st Century AD. Polo was a popular sport of the Emperors in Asia in the early centuries. The modern game of polo originates from Manipur (now a state in India). In 1862 the first polo match, Calcutta Polo Club, was founded by two British soldiers stationed in India. Military officers imported the game to England in the 1860s. Around the same time, British settlers in Argentina began playing the sport. The first polo match in Argentina was played in 1875. Since the mid-1800s, the sport has spread throughout the Americas in Brazil, Chile, Mexico, and the United States. As a self-proclaimed horse lover, I enjoyed watching the “polo ponies” the most during the games. The horses used for polo are not actual ponies as they are called. Most of the “ponies” are horses that stand between 14.2 and 16 hands (a hand is equivalent to 4 inches and is measured from the ground to the withers (where the neck meets the back)). Most of the polo ponies are Thoroughbreds or Thoroughbred crosses. Thoroughbreds are a very popular horse breed outside of horse racing due to their speed, stamina, and agility. I owned a Thoroughbred for a few years and trained him as a show jumper. All players have more than one horse to ride throughout the game to keep the horse “fresh.” As you can imagine it can be a tiring game for a horse running up and down the field sometimes at a full gallop. 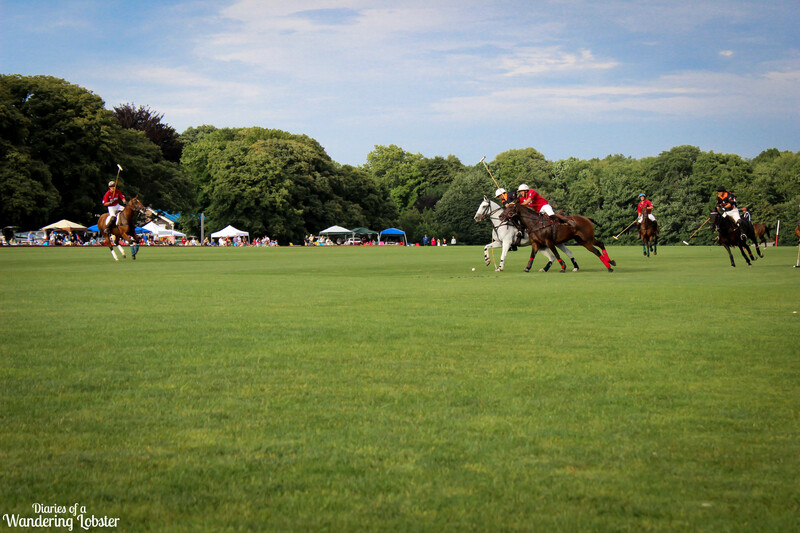 Newport Polo Club matches are played at the historic Glen Farm in Portsmouth, Rhode Island. The land was settled in 1630s with some of the very first settlers in America. The field is located a short drive from Newport. Matches are played every Saturday from June through September starting at 5pm (4pm in September). Matches are played against other teams from the USA or international teams from far-away places like Singapore, Ireland, and Kenya. There are three levels of admission: lawn seats ($12/person), box seats ($20/person), and VIP Lounge passes ($50/person). Parking is free and you need to pay in cash! Dogs are welcomed on leash and you can bring a picnic and blanket and/or chairs. People will commonly tailgate before the match begins. My friend and I attended the July 26th match between Newport and Palm Beach. It was sprinkling a little in the afternoon, but other than that the weather was decent. We met up with my sister and her friends who had set up a tent and had been tailgating for a couple of hours prior to our arrival. We brought a picnic lunch of cheese and crackers, fruit, and some lavender mead from Maine Mead Works. The game started about 20 minutes late because one of the team’s horse trailer got stuck in traffic. Once all the horses arrived, the teams paraded around the field for the audience and they began warming up. The announcer, who had a wonderful British accent (swoon! ), announced the players and played the National Anthem. Soon the first chukka began! We had lawn seats, but most of the game was being played at the other side of the field. Like football, after each goal is scored, the teams switch sides. Palm Beach quickly took the lead and held it for the rest of the match. As soon as the whistle went off I moved myself up to the front lines to watch the match as I was excited to see the game! Everyone else stayed back at the tent and drank beer and wine. The game was fast-moving and the 7 minute chukkas went by quickly. I was quite impressed with the rider’s horsemen abilities. Polo is a tough sport and requires not only the horse to be agile and move in any one direction at the drop of a dime, but the rider needs to be able to control and maneuver the horse to get to the ball. Not to mention there is a giant mallet being swung around one’s head! Since Newport plays 6 chukkas, there is an intermission between the 3rd and 4th chukka. During this time the audience is invited to “stomp the divots” in the field. During play, divots or small holes in the turf are formed by the horses’ hooves. Patrons will walk across the field to stomp the grass back in place. At this time patrons can meet some of the players as they walk their horses back to the playing field. Just as quickly as we were able to walk on the field, the refs ushered us off the field to resume play. Palm Beach quickly scored more goals, but Newport was able to rally a bit during the final chukka. Palm Beach won the match with a score of 11 to 8. Bummer for the home team! I enjoyed the game and I would go back in a heartbeat to see another match, preferably against a foreign team (hello gorgeous Argentinan men!). However, I really want a telephoto lens so I can take better pictures! 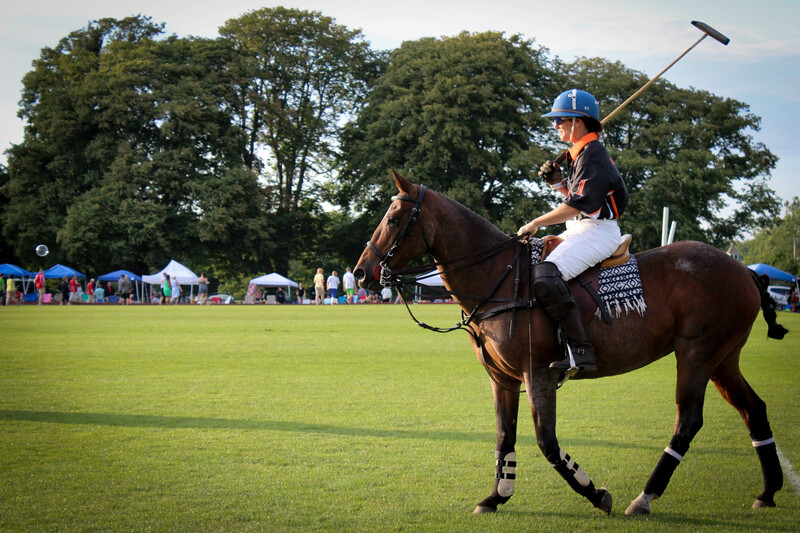 Have you ever seen a polo match before? Would you ever consider playing? Hat tip to polo players all over the world! Man, I can’t imagine riding a horse that fast while swinging at a small ball with a mallet that has that small of a head. How do these guys do it? It’s fun to watch, though. Although I haven’t seen a live match. Maybe on my next trip to Newport. It should give me a better idea of how the “other half” lives. Hehe. Yes, definitely check polo out sometimes. It’s a crazy sport!